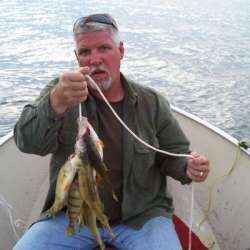 For more Yellow Perch photos visit Lake-Link's Photo Gallery. 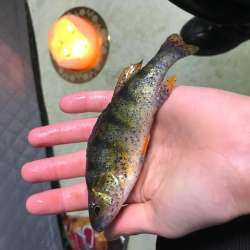 The yellow perch occurs in all three drainage basins in Wisconsin (Lake Michigan, Mississippi River, and Lake Superior), in all of the state's boundary waters, and in Lakes Michigan and Superior. 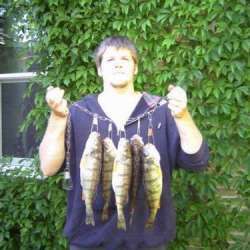 Because the yellow perch is a glacial lakes species, it is widely distributed except in the unglaciated region of southwestern Wisconsin. Spawning normally occurs shortly after ice-out in April or early May at water temperatures of 45-52ºF. Yellow perch spawning closely follows that of walleyes and often coincides with that of suckers. Yellow perch are random spawners, and do not construct nests, nor do they guard their eggs and their young. 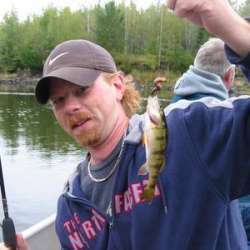 Yellow perch are primarily bottom feeders with a slow deliberate bite. They eat almost anything, but prefer minnows, insect larvae, plankton, and worms. Tackle may range from a simple handline or a fly rod in summer to a short, whippy, jigging rod in winter. Because perch prefer cooler water, the best fishing is usually in deep water. Perch move about in schools, often numbering in the hundreds. If one spot is unproductive after a few tries, it is best to move to other spots until a school is located. 2 lbs 9 ozs caught by Joseph Grega caught on on January 5, 1974. 2 lbs 8 ozs caught by Roy W. Burkel Jr. caught on Gravel Pit on January 1, 1981. 2 lbs 3 ozs caught by Daniel Borchardt caught on Morse Lake on March 1, 1994. 2 lbs 3 ozs caught by Steven Moore caught on Bussey Lake on December 1, 2001. 3 lbs 12 ozs caught by George E. Slutter caught on Independence Lake, Marquette County on January 1, 1947. 3 lbs 4 ozs caught on Plantagenet, Hubbard County. 3 lbs 4 ozs caught on Lake Winnebago, Winnebago County.